When you search for the term ‘raw food diet’ you’ll see a couple of interesting stats. This page shows you that 5,400 people (in Australia) are searching for the phrase ‘raw food diet’ each and every month. A phrase means those words are part of a sentence. 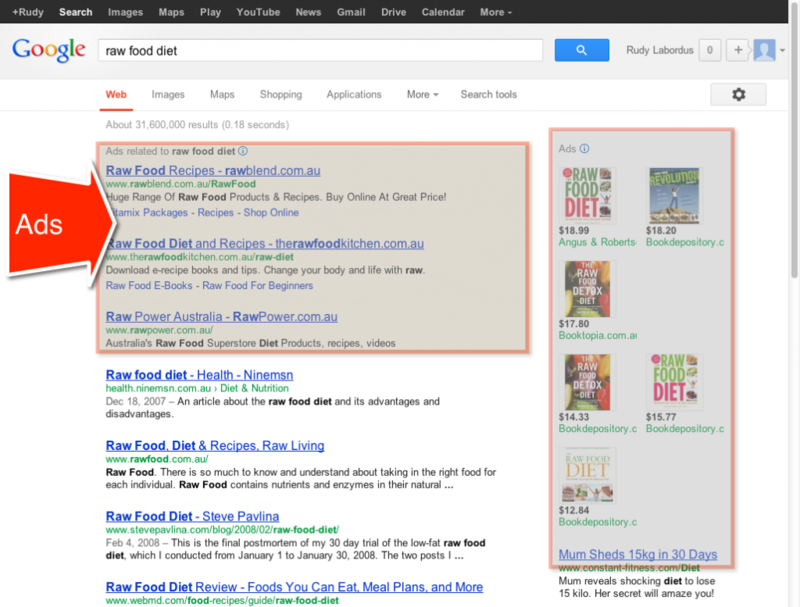 It also shows that 2,400 people (in Australia) are searching for the ‘exact’ match ‘raw food diet’. Which means there are 2,400 people each month looking for only the three words ‘raw food diet’ with no other words before or after. It means there is a significant interest in this topic. 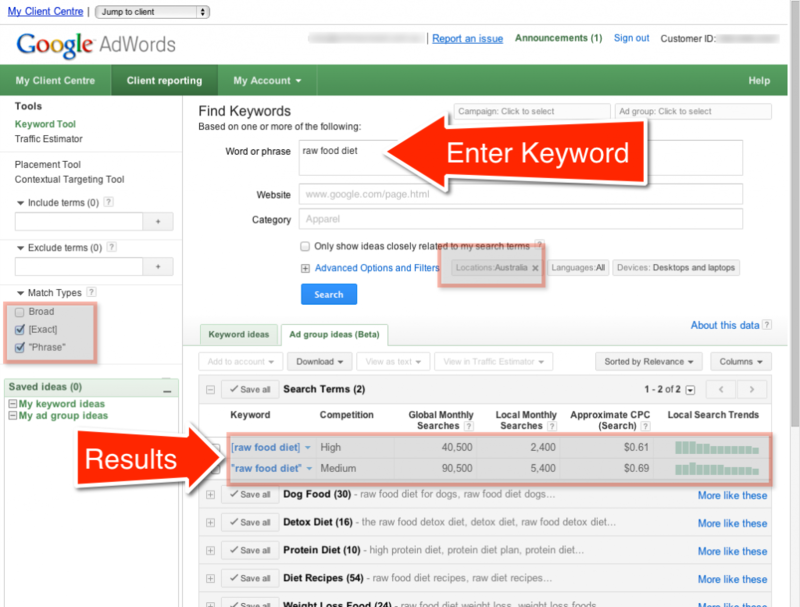 (approximate CPC = cost per click). It also shows that companies are paying google 61c – 69c each time someone clicks on their ad which they place on the top or the right of the results. When you consider that google wants to give it’s end user the best experience, you’ll appreciate that google will do what it can to find the best match web site to offer back to people who are searching for whatever they are searching for – in this case – raw food diet. Any site that is built on the domain rawfooddiet.com.au (with a little SEO to help it along) will get ranked number 1 for that search term because the domain contains the keywords that people are searching for, meaning to Google that the whole site must be about this topic – so it is THE most relevant result. Google’s own statistics have shown that on average a result that is shown in position 1 gets 42% of all the traffic. Position 2 gets 18% of all the traffic and position 3 gets 8% of all the traffic. So with an exact match domain like this, getting to the number 1 is a bit of a no brainer. Meaning you will get 42% of the traffic for free, where other people who are willing to pay for ads are paying 69c per click. If we only look at the exact match results only (you’ll get a lot more, but lets be pessimistic for a minute), you would get 42% of 2400 people (1000 people) directed to this site each month for free whilst others pay 1000 x 0.61c = $610 per month, every month, forever – and this cost just continues to increase as things become more competitive and google continues to raise it’s advertising prices. By having this domain, you’re effectively getting each year around $7,300 in commercial value. That’s a lot of traffic other people are already happily paying to get. So the question then is, how quickly do you expect a return on your investment. If you buy a property, you would get 5% return on your investment. 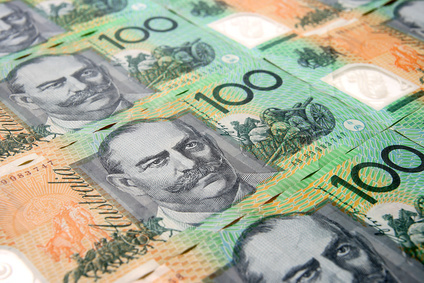 If you buy this domain for $3,000 – you would get $7,300 in value each year. And domains go up in value just like property, so when you’re done with it, you can always sell it and get your money back (or more because as names become more scarce, domain prices keep rising too). Since there is no traffic and no site there at the moment, I would look at the site as opportunistic, wich is why I feel its worth only $3,000 and not $30,000.